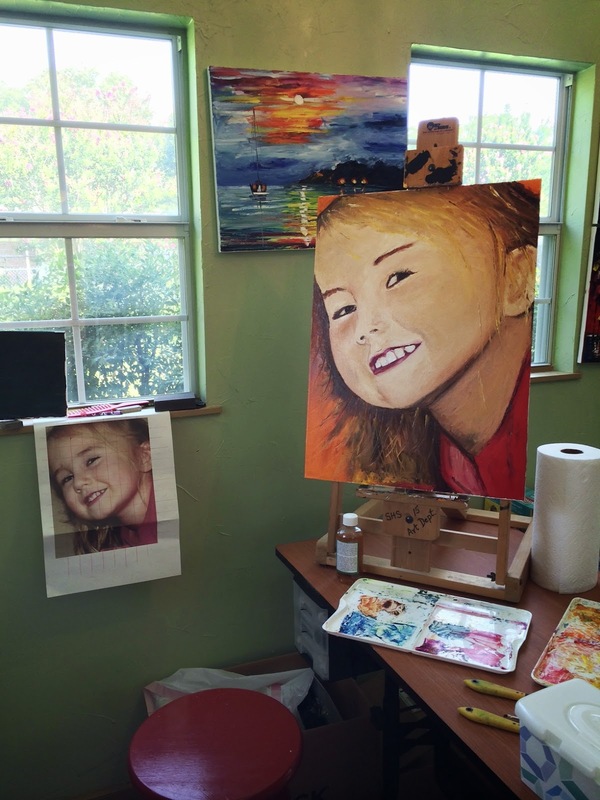 Faith, Hope and Art: Paint for Joy, Not Perfection! A while back... maybe a few months, maybe a year, I drew this out on a canvas at school to show students how easy it is to grid a portrait quickly and precisely. It's from a photo that I took of Kylie in our old house.. so the photo is easily a few years old! Anyway... I drew it and then moved on. Last night I had some paint out on the palette left over from the painting I just finished so I decided to just paint the portrait. And so I did. Complete with children that had to be fed, Doug away at a meeting and life happening all around. I got the basic face done before bed. After everyone was asleep I was able to work about an hour in peace. It's a rare gift. Then this morning, I finished the painting up. You can see the photo that I worked from in the picture below. Here is a close up. The oil paint is still wet. 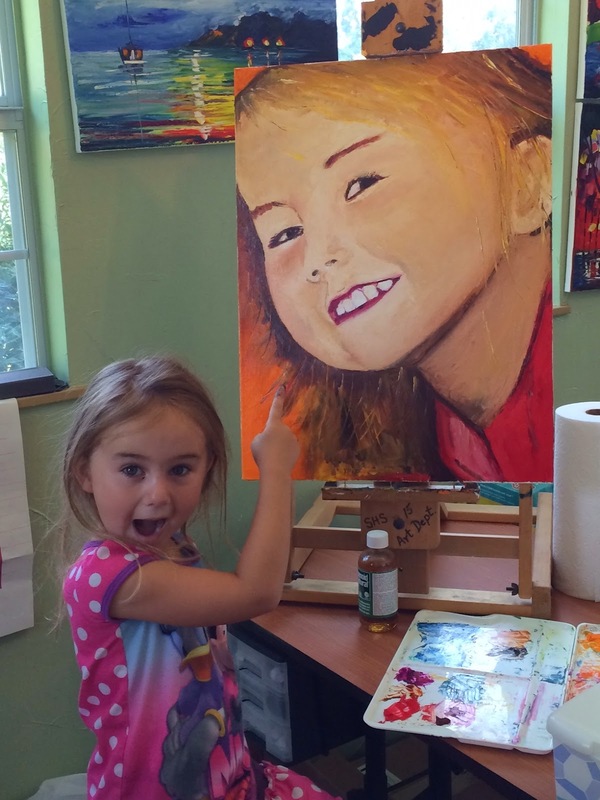 And here is Kylie showing off her portrait. So why do I give you the back story and not just the finished piece? Because I think it is important for the viewer of the painting to know that I paint for the joy of it. Not for perfection. I have the ability to paint it perfectly. But that would be incredibly time consuming and frustrating. If I simply want an exact copy, I can order an enlargement of the photo easily. But I paint for the joy of painting. Painting is good for my soul. It makes me calm down, take a deep breath and enjoy the process. So much of life is about hurrying and "getting things done." Granted, I still paint incredibly quickly. All in, I painted the portrait in a total of less than 6 hours... and all but about an hour of it was with my "groupies." The little girls even painted next to me this morning. It's good for their souls to paint too. 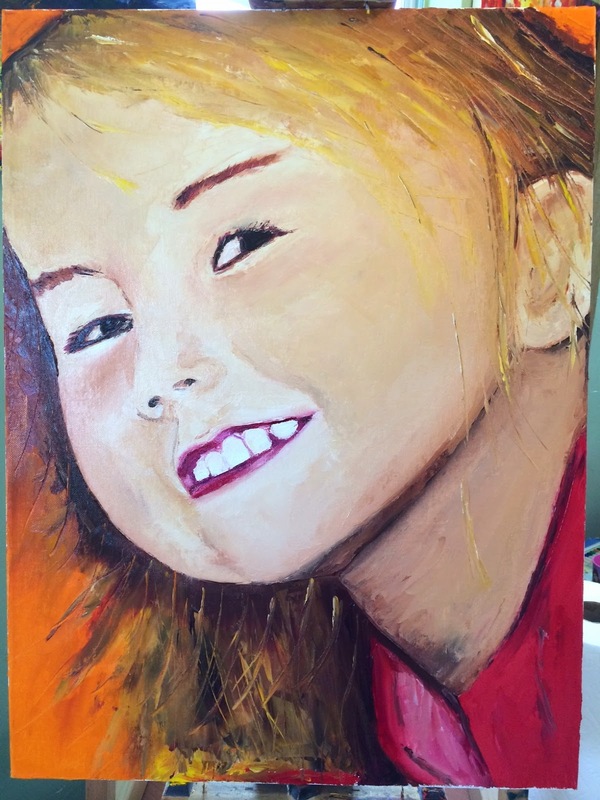 People are all the time saying to me that they can't paint, or they don't have any artistic skill or that they "can't even draw a stick figure.." My answer is to do it anyway. The more we create, the more we have the capacity to create. We have to move past the expectation that our paintings should be exact copies of what we are looking at, or perfectly executed, or even "pretty" to look at. There is something incredibly cathartic about mixing paint on a canvas. Sure, when the colors mixed actually look like the color you wanted, it's great, but that takes time and practice. I am constantly amazed that people think being able to draw and/or paint realistic things/objects/people is supposed to be easy. But that everything else we learn to do, be it read, tie our shoes, throw a football or even drive a car is expected to take effort, practice and a lot of work. Why should art be any different? Someone along the way said it was "easy" and he/she LIED! So, here is my challenge to all of you out there. Stop giving up before you even start! Go buy a cheap canvas and some paint. And paint. Paint a rainbow if that's what you loved to paint as a child. Or a Ninja Turtle.. or a car or a tree. You could even just put the paint on the canvas in a random pattern! But create. Today. Not for perfection. For the JOY!